Isn’t it a pain having to take the time to adjust to a new gaming mouse? You might have thought about upgrading to a high tech laser mouse to enhance game play, but the thoughts of having to adapt might be a big turn off. We designed the aLLreLi X100 Programmable Wired USB Laser Gaming Mouse to adapt to you, not the other way around, giving you the gaming experience you want and deserve. When we say that the aLLreLi X100 Programmable Wired USB Laser Gaming Mouse is a programmable gaming mouse, we really mean it. Our wired mouse can be adjusted in many different ways, giving you a gaming mouse that seems as if it were built to your exact specifications. Very easy to program and use, the aLLreLi X100 Programmable Wired USB Laser Gaming Mouse has six DPI settings, so you can choose from 800-1200-2000-3200-5000-7200 sensitivity modes. The on board AVAGO3310 laser engine ensures optimal performance with any of the settings. As you set the aLLreLi X100 Programmable Wired USB Laser Gaming Mouse, the wired mouse shines with different breathing lights. There are six colors in all: one to correspond to each DPI level. You can set which color goes with which yourself, making it easy to tell where your mouse is set at all times. In addition to adjusting the light and resolution, the aLLreLi X100 Programmable Wired USB Laser Gaming Mouse allows you to customize its buttons. With the laser mouse, you’ll receive asoftware program with a profile and macro editor for creating different button maps for all of your favorite games. With a USB 2.0/3.0 port, the aLLreLi X100 Programmable Wired USB Laser Gaming Mouse provides lightning fast full speed transmission with a report rate of 1000 hertz and a tracking speed of 60 inches per second with 20G acceleration. It will have you moving faster and more precisely than ever before! 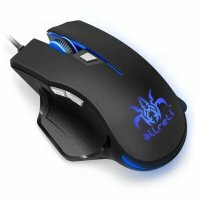 which mouse is better the X100 or the M811Lu? is it posible to configure user profiles in this mouse? The X100 is equipped with an AVAGO3310 laser engine, the M811bu is our old style. The DPI is different, X100 has six DPI, the largest DPI is 7200, M811bu has eight DPI , the largest is 8200. The both can’t compatible with mac. Any problem feel free contact us. Hi, in the amazon specs, it says that the X100 is copatible with OS operating system. then what exactly means that it can´t compatible with Mac? the mouse X100 will not work with a iMAC? 5 out of 5	Mouse with more going for it than some of the more expensive ones! Does exactly as it states on the tin, I use this for gaming…was not sure if this would be better than my previous wireless logitech £60 bit of kit but very pleased with this…early days still but enjoying going back to cable and the DPI control…can not go wrong for this price! I’ve had this mouse for over a year now, it drops on the floor at least 10 times a day and still going strong! Love it. Outlived all other mice I’ve had during this time. Absolutely love this Mouse. My new job requires me to review huge documents and the mouse that came with my “work issued” computer was just not cutting it. Love this mouse. Makes work so much better.